It's easing into the world of keyboard-free Chrome OS devices. HP is joining Acer in making Chrome OS devices that can do away with the keyboard. It just unveiled the Chromebook x2, a 12.3-inch laptop that's really a detachable tablet -- unlike the earlier Chromebook x360, you can leave the keyboard behind instead of merely flipping it behind the screen (though you can do that too). There's an included pen for note-taking and sketching, and you'll find a 13-megapixel rear camera on top of a more conventional 5-megapixel front shooter. It's a fairly powerful machine, too. We wouldn't describe the 1GHz Core m3 as "high-performance" like HP does, but the 2,400 x 1,600 display, 4GB of RAM (8GB is an option), 32GB of expandable storage and claimed 10.5-hour battery life make it more powerful than a garden variety Chromebook. And while the fully-attached combo isn't the lightest at just under 3.2lbs, the 1.6 pounds of the tablet portion is considerably easier to carry when you're scribbling in OneNote or watching Netflix. And importantly, it hits a price sweet spot. The system will sell for $599 (keyboard and pen included) when it arrives in June. That's considerably more than many Chromebooks, but it's on the low end as far as detachable tablets go. 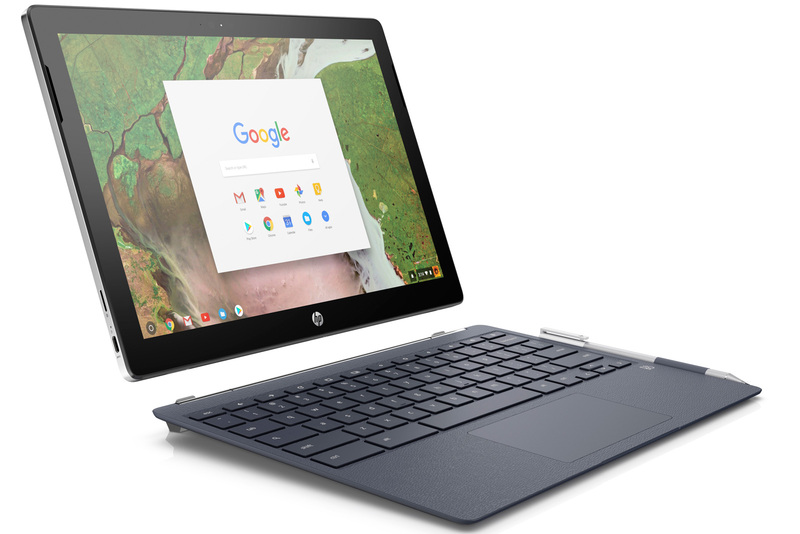 HP not-so-subtly pitches the Chromebook x2 as a rival to the iPad Pro, which currently starts at $649 without a pen or keyboard. With that said, the two are frequently different beasts -- the iPad is primarily a tablet that happens to have keyboard support, while the Chromebook x2 is really a laptop with some convenient tablet functions thrown in.